As the rover drove away from Tyrone, its jammed right front wheel dug this trench; the site was later dubbed Gertrude Weise. Scientists first thought the white soil was caused by sulfate minerals, but the Mini-TES instrument revealed its high silica content, and the rover returned to the site to confirm the discovery. Scientistshave found signs that water may once have gurgled up through the Martian soilin hydrothermal vents similar to those in Yellowstone National Park. The site ofthese proposed vents could possibly contain preserved traces of ancient Martianlife, scientists say. That assumes, of course, that life might once haveexisted on Mars. No firm evidence for that idea has ever been found, however. The ventsevidence comes from NASA's Mars ExplorationRover Spirit. 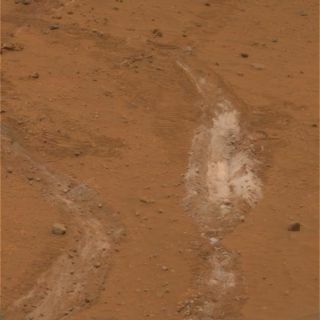 The robotic explorer found deposits of pure silica, a form ofthe element silicon that occurs when hot water reacts with rocks (quartz is apure silica), in Mars' Gusev Crater in 2007. The discovery was announcedbriefly at the time, but scientists have now had time to fully analyze thedeposits. The results are detailed in the May 23 issue of the journal Science. The silicawas found when Spirit was exploring the Columbia Hills, which rise 300 feet(100 meters) from the middle of the flat lava plain that fills Gusev Crater.Scientists were uncertain about just what had formed these hills. WhileSpirit was parked near an area known as the Tyrone site, mission scientistsused the rover's Miniature Thermal Emission Spectrometer (Mini-TES) to look atsome nearby "knobby outcrops," said study team member Steven Ruff of Arizona State University. "Itwasn't clear what we were seeing in the knobby outcrops because they werecontaminated with dust and wind-blown soil. But I thought they might besilica-rich," Ruff said. Surveys ofother crops showed the same hintsof silica, but were likewise contaminated. That's when the rover's jammedright front wheel came to the rescue. As the rover was driving in reverse, itscrippled wheel dug a trench behind it. "Weaimed the Mini-TES at the trench and it showed a clear silica spectrum,"Ruff said. They also analyzed the trench's white soil with the rover's AlphaParticle X-Ray Spectrometer which showed that the soil was more than 90 percentsilica. "That a record high for silica on Mars," Ruff said. Making suchpure silica requires a lot of hot water, Ruff said. "On Earth, the onlyway to have this kind of silica enrichment is by hot water reacting with rocks,"he said, making the connection to hydrothermal vents. Thisrelationship also links the silica to Home Plate, a football field-sizedvolcanic feature in the Columbia Hills. "Home Plate came from an explosivevolcanic event with water or ice being involved," Ruff explained. The teameventually found silica deposits in many other places nearby. Becausehydrothermal vents on Earth harbor life, scientists suspect that they may oncehave done so on Mars. And the trace could beleft in the silica deposits. "OnEarth, hydrothermal deposits teem with life and the associated silica depositstypically contain fossil remains of microbes," said study team member JackFarmer, also of ASU. "Butwe don?t know if that's the case here," he added, "because the roversdon't carry instruments that can detect microscopic life." The sitestands in contrast to the one that NASA hopes will be explored by its PhoenixMars Lander starting next week, because while Phoenix will be looking atthe potential habitability of Mars' north polar region today and in the morerecent geologic past, the silica deposits in Gusev Crater represent a"possible habitable environment of Mars' ancient past," Ruff told SPACE.com.